2008.07.30 (Wed) - Slept late, drove in, work went well. Yesterday I was having issues getting CSLA and the ProjectTracker project to compile on my system. Today I asked for assistance and got pointed in the right direction. Amazing how that works, with the advice I was able to get it all working. I took off at lunch looking for photo opportunities but found none. After work I returned home about the same time Robin did. We got changed, grabbed a bite to eat, and took off with the camera for a nice walk around the neighborhood. 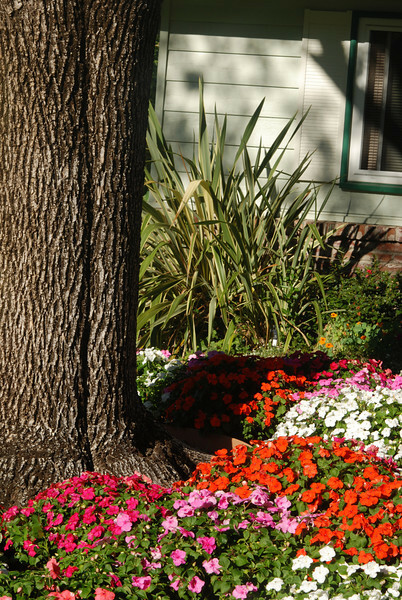 We live in an older neighborhood but the homes and yards are well kept. I wish we had the same green thumb that some of my neighbors do. I grabbed this shot, then took off for my regular Wednesday night mens study. It was great, left feeling pretty good. Nice to get a good attitude adjustment now and then. I returned home, posted my daily photo and now off to enjoy the rest of my evening with Robin and Brandon.